To me, catching a fish on the fly is somehow just that bit more satisfying. Catching a big fish on the fly is one helluva experience. The take followed by the blistering runs and then the insane bends in the rod are pretty much enough to keep me coming back for more. Not forgetting the joys of fly casting, watching your fly unfold perfectly, the slow strip in anticipation of a tug and then the sound of the drag clicker going crazy. I could go on, and I will. In preparation for the big trip to Exmouth in Western Australia, we found ourselves trying to get the hang of fly fishing for biggins and working on casting accuracy at a fresh water sport fishing joint which stocks huge fish and perhaps the only place in Singapore where it is possible to properly test our newly acquired equipment on sizeable fishes which fight hard. The tricks to catching a fish on fly here at Fishing Paradise at Orto are distance and lots of bread. Yup. Bread. It begins with chumming the water with bread (some or many may disagree with this way of fishing but I don’t think there’s anything wrong since the fish are all stocked to begin with. The debate only really starts when wild fish are involved). Once the surface starts to boil, you make a cast beyond the boil, usually 70/80ft away (sometimes closer) and SLOWLY strip your fly back. Sometimes so slow it is almost stationary. The anticipation is nerve wrecking I swear. If you want to target specific fish like the Pacu, distance is essential. Basically, in order to maximise your chances of catching anything other than the Patin (iridescent shark), a long cast must be made beyond the boil. This is because when the fishes gather around the chum, it is usually the Patin(s) that are closest and when they feed, they slap their tails. This usually means no other fish in a 5ft radius. The flies used are tied with rabbit zonkers in various colours to imitate soggy bread. Lol. So therefore, anything but not limited to white or brown, will work. In fact anything from red to black will also do the trick. It does not necessarily have to be zonker though. I’ve used sculpting fibre in Tan colour and it worked perfectly fine. Just make sure it has plenty of volume and a slight tail at the back to impart some action. Streamers work well too. So do wooly buggers and baitfish patterns. 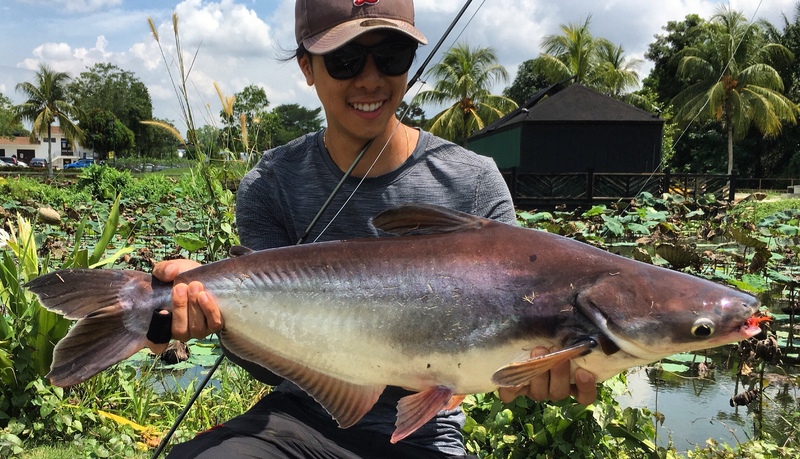 On occasions, you’d be able to get the Pacus and Chao Praya Catfishes on blind casts with bigger profile streamers on an Intermediate line. A rod between 5-8 weight and being able to cast anything over 70ft would be ideal. I think a 6 weight is just nice and an 8 weight is pretty much a safe bet. Sometimes I use a 10 weight just for fun. Superb line management will come in handy too for those blistering first runs and therefore a good amount of backing is a definite must, lest you lose those fly lines.